We stayed here for 11 nights as a change from the hotel we normally stay at in Protaras because of the building work there and overall we were pleased with our choice. The hotel makes a great first impression and the entrance and lobby are very grand. We stayed in a superior room for 2 adults and 2 children and although not massive was adequate for a holiday. Our room, although needed updating was very clean when we arrived but was not cleaned very well during our stay especially the bathroom. We were supposed to have an inland view, but ended up with a side sea view on the top floor, which was lovely and we had an end room, so only had neighbours on one side who we never heard once even though they had small children with them. The breakfast was nice with lots of choice and although busy they never ran out of anything and you never had to queue. The pools were good, yes there are missing tiles in places and the bottom is like sandpaper but overall with the exception of Egypt I don't know of many beachfront hotels with better pool facilities. The slides operate from 11-1 and then from 3-5 which was long enough not to get bored of them. The lazy river was surprisingly powerful and never busy. We went down to the pools at 09.30 and never had a problem getting 4 beds together, in fact we sat in the same place every day. The hotels bars were expensive and that's why they were deserted. I can't comment on the evening meal as we didn't have it except to say it was usually quite full and they made an effort with the table settings with white tablecloths and glasses and flowers and live music playing. Overall we probably wouldn't return as we prefer Protaras, we found Nissi Avenue to be too busy, but if we could move this hotel to a quieter location we would visit again. We were only there for 1 week and on 2 days the cleaners did not come to our room. Food was OK similar to an all you can eat place in UK. The location was by the beach and 3km from town. The hotel staff were generally pleasant, but the hotel was fully booked and they struggled to cope at times. The entertainment was quite good. We were there for a wedding and because they were full, many promises were broken.eg Private dining reception room not given we had to eat in the main dining area. Bridal suite not available as promised. Champagne breakfast not as promised. Really let down on what should have been magical day. I took my family to Adams on 3/08/2008 for 2 weeks and i have only got good things to say about it really and a few gripes. We arrived on our holiday/honeymoon. Having got married on the last hot day of the year my wife and step children aged 8 and 6yrs. Having e mailed the hotel prior to arrival to make sure we had a divide between the beds. Being a honeymoon aswell you need a little bit of privacy dont you. Anyway the manager upgraded us to two rooms with an interconnecting door. Superb, privacy, two bathrooms, two balconies and a view over the sea to die for. Thank you kindly Mr Manager (Nicos) this made our holiday. Arriving at mid afternoon and looking out of the balcony - the beach is jammed the teenagers are there in force and the constant thump of rave music hits you. Oops you think, gonna be noisy ?. No not at all come 6 pm the beach is getting deserted and the teenagers are off to Ayia Napa on their bikes, crazy noise goes with them. So fear not its a peaceful place at night. This place is top draw and the weddings dont affect you, in fact you find them pleasent to view, and if you plan to marry here, its done very well indeed. The gripes - well the pool is breaking up in places ( told there is a refurb for 2009)but on the other hand its kept clean and well supervised around the slides. Some of the fountains are fab. No prob's getting beds, free towels which was great and very handy. The private beach has a bit of rubbish around the edges mostly from the teenagers around the corner. Must do- take a boat trip, we went on a catamaran and had the time of our lives swimming off the boat plus food and entertainment for the kids. Visit the Aqua park another great day. We ate out every night and went into Ayia Napa a few times about 8 euro's and had some superb meals in some superb restuarants. Great fun fair for kids. 5 minute walk along the road to the restaurants- recommend the "Wild west" if you get a chance. Overall the clealiness, the people and the hotel are superb. Cant comment on the evening meals but the breakfast is plentiful and what you would expect from a 4 - 5 star hotel. Brilliant everything you would expect from a 5 star hotel. We are breakfast the, it was delicious lot to choose from, something for everyone. We ate out for tea though, we took a walk into ayia napa which took about 10 minutes. Some really nice restaurants there, with play areas at the back for children! So the location itself was't bad. The hotel staff, they were fine i've had trouble with some staff at other hotels not understanding English, but here they were fine. The entertainment was brilliant, disco's for kids and karaoke for adults and families and more.. The rooms I thought were quite small, you just had your bathroom and a bedroom, and a balcony. The pools were brill, especially the lazy river that was perfect if you just wanted to relax. The worst bit about he pools were the slides, really old and there were only 2, they let it down. The beach was nice, it was private. we've just returned from staying at adams beach, we went for our wedding, the hotel was lovely, very clean, we had a family room and it was really a good size. the pools are really clean and child safe, our 3 children loved the pool and the slides, the only thing the slides should be on longer than what they are. for our wedding we got married in the hotel grounds which was excellent, we used aphrodite wedding services which were brillant they done everything for us, i would recommend them to anyone, we had a problem with the hotel over our wedding reception and they came straight out and sorted it for us, they organised our reception in a restaurant which was really lovely and the food was fabulous. i would return to adams beach, and i would recommend it to people who thiking of getting married and also use aphrodite weddings they just take the presure of you. My husband and I got married back in August in Adams beach Ayia Napa. The hotel was 5++++ all the way. We have a lovely room but we also booked in the honeymoon room for the wedding night what made the wedding all that bit more special. We booked the whole thing ourselves, and managed to save well over a thousand pounds!!! We managed to find everything we needed all on line. We'd like to thank everyone at HAIR & BEAUTY INTERNATIONAL for all there help, not only did they do a fantastic job on my hair but Jodie the owner went above and beyond when my husband forgot his waistcoat, men ? I would also like to thank the staff at the florist in the Adams beach for doing a wonderful job on all the flowers .. I would also like to recommend Jill and Steve at Still productions for the amazing dvd of the whole day. If anyone would like more info on any of the people we dealt with in Ayia Napa please get in touch as Id be more than happy to pass on contact details. My partner our two children and another family have just come back from our two week holiday to AB. Upon arrival we were impressed with the overall appearence of the hotel. It took a while to check into the hotel,only due to us trying to upgrade to a queen suite.Prior to arrival we had requested an upgrade from a kids suite,but to our disappointment we werent able to upgrade but our friends had been allocated one even tho they only had one child of 12 and we had one of 12 and a baby aged 2.Although we had a fantastic view of the sea and pool,if you are a family of 2 or more children I would definately recommend the queen suite,it was far more spacious with an extra wardrobe,bathroom and sofas.They are located away from the hotel by the pools but if you have a buggy they are more spacious for the extra baby bits.This was very disapointing for us that we got the smaller room as we needed the extra room,I feel the hotel should have thought more wisely about room allocation as we booked our holiday with our friends! I was impressed with the hotel in general,the pool was fantastic for the kids,they loved the slides and the lazy river.The slides were on at regular intervals during the day but not open all the time.The pool bar was great for cocktails,but we didn't rate the food.The restuarant overlooking the sea on the other side served much nicer tasting food plus you get a fab view! The hotel entertainment was a bit dier!We went to saturday night fever which was terrible....god knows what Simon Cowell would have said!!! But I would recommend the Magic show the guy was very funny and my little girl got a dog balloon at the end which made her day! We did find the hotel a little overpriced,so after eating their the first night we decided to walk to the restuarants 10 minutes down the road.We found an AMAZING place called the Garden,the food was exceptional and it had a fantastic play area for the kids!We ended up eating there about 6 times!Then after the meal we had a great time next door in the garden bar where they did Kareoke....where they get the audience involved,great excuse for a free shot! We also found another superb restaurant called Yo Thai,this is very new so some taxi drivers didn't know where this was,heading towards Agia Napa its on the right.We went twice the secomd time we decided to try Tepinayki which was the best night us and the kids had....you must try if you like a laugh! We also found a place called Landa beach,which was gorgeous,you can get to this by walking round the edge of the bay from the hotel.When the wind is blowing away from the sea the water is so clear its like being in the carribean!Dont go if the wind is blowing in from the sea as the water gets full of rubbish apparently blown in from Eygpt!! At the hotel we met every night in the Piano bar,this was our favourite place with the lady playing on the piano every night,and in the corner a beautiful myst effect over a water feature which gave the room a lovely feel!If you like cocktails try the blue moon!!! Overall I found the staff very freindly and our stay was very enjoyable!The hotel shop is very very convenient and you can buy just about anything you need in there,you can charge this to your room which i did every day,but this soon adds up so beware!!! I have read previous reviews and I didn't find the weddings too bad,there were some going on but they didn't effect us in any way and to be honest didn't take much notice,we also managed to get sunbeds on the beach by the baby pool although I think its harder to get them on the pool side! 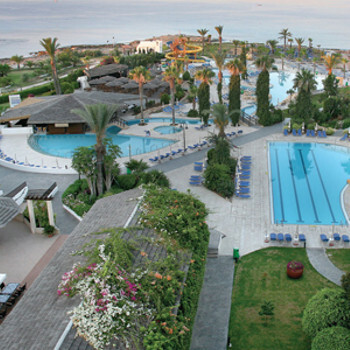 I would recommend the hotel to anyone wanting to visit Cyprus! We stayed at the Adams Beach Hotel by Nissi Beach. The hotel enteraintment was very substandard apart from three acts(nick from the uk,The Magjician and The motown Sisters).The others were total rubbish. Talking about rubbish- rubbish is often scatered around the hotel corriders were empty bottles of beer and uneaten food left on plates seem to lay for days. They seemed to have ben left out by the cleaners and forgotton about. There is a sun lounger issue to get a sun bed by the pool be prepared to place your towel on the bed by 05.00am. Hotel staff knew of the problem but are not bothered!. Hotel location is close to Aya Nappa aroun about five Cyprus pounds in a cab to get there were there are some great resturants to visit.